"Siguro, half oo, half hindi," says Bianca Gonzales about the possibility of getting back together with former boyfriend Lito Cayetano. 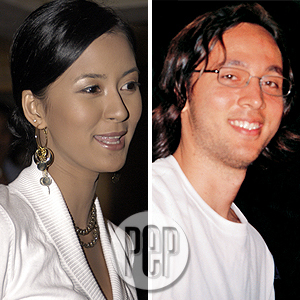 For TV host Bianca Gonzales, her one-year-and-a-half love affair with TV director Lino Cayetano felt like they have been together for five years. Although she has already accepted the fact that Lino is now dating Sharon Cuneta's daughter KC Concepcion, Bianca admits she still hurts every time she sees her former boyfriend with his new squeeze. And that Lino still has a special part in her heart. "Of course, I don't think naman na matatanggal ‘yon. Siguro dala-dala ko na ‘yan forever, kasi when you share with someone a good time of your life, dala-dala mo na ‘yon," said Bianca during the press launch of Pinoy Big Brother Season 2 last February 14 at ABS-CBN's 9501 Restaurant. Bianca would not divulge much on their break-up no matter how persistent the press was to get the full detail as to who asked for the separation. "Sorry, that I won't answer na lang po in respect to Lino na lang," said Bianca. But the TV host admitted that her "affair" with model-turned-actor Zanjoe Marudo during their stint in Pinoy Big Brother Celebrity Edition could have also triggered their falling out. "I wouldn't entirely say na walang kinalaman ‘yon. Of course, it's a part of it. I wouldn't say it's the only reason. I wouldn't say na it's a big reason. But it's a part of it. Both of us, we have our own pains and issues with each other. But I wouldn't say na dala-dala because that time, after na parang pareho kaming okay na, we were really enjoying our time together." After their break-up, Bianca shied away from the press. Bianca explained, "Honestly, yes. I keep on saying it na even though it's a tough time yung buong 2006, especially the end of the year. ‘Kala ko parang okay... then mahirap... okay pa, okay pa, biglang humirap na naman, all I kept on thinking was it's such a blessing na parang plinano ni Lord, kasi yun nga, that happened part of October. And then everyday I was so busy until December 16, Grand Dream Night (of Pinoy Dream Academy) po namin. And then after ng Grand Dream Night, holiday na, focus na ‘ko sa family ko. New Year ko with my family, out of town." The TV host continued, "I was thankful na parang God made na parang may timeline in a such a way na I can heal better. So when I got back, start na ng PDA. For me, better na rin na parang when I get to tell my story or whatever, yung may time na medyo strong enough na ako to talk about it. Hindi na ako yung emotional na objective or whatever." Then came the news that Lino and KC were dating. "The first time I've heard about it, of course I was affected, but who wouldn't be naman, di ba? Any normal break-up situation, then he'll find someone new, of course, you'll get affected." But even before the press feasted on the Lino-KC affair, Bianca already knew about it. "He [Lino] told me about it. Of course it was hard for him. You can see it naman sa eyes nung tao. And he told me before everyone else found out. I was the first person [to know about it]. He told me, they went out. He told me about it [Lino and KC's Hong Kong date] but I wouldn't wanna hear about it, mainly because business nila ‘yon. Pero na-feel ko na sobra talaga our respect for each other na parang ayaw niyang ma-shock ako. Kaya he mentioned it to me," said Bianca. How hard did she cry? "A lot talaga," she admitted. "Parang lahat ng iniyak ko from each year, ganoon ang amount ng iniyak ko nung 2006. So hard. My whole... ‘di ko rin masasabi." Is there a possibility that her romance with Zanjoe blossom again? "Hindi ko naman iisipin din na gano'n. Kunwari two people tapos nag-break sila, not because he has someone new, it doesn't necceserily mean I have [to have] someone new in my life," said Bianca. Bianca mentioned that she still sees Lino. "We're in touch," she revealed. "But not often in touch a good number of times." But when asked if she's expecting a reconciliation, Bianca answered, "Siguro, half oo, half hindi." Bianca will host the Update of PBB 2 which will begin on February 25.